An unexpectedly strong blast from the Sun hit Mars this month, observed by NASA missions in orbit and on the surface. "NASA's distributed set of science missions is in the right place to detect activity on the Sun and examine the effects of such solar events at Mars as never possible before," said MAVEN Program Scientist Elsayed Talaat, program scientist at NASA Headquarters, Washington, for NASA's Mars Atmosphere and Volatile Evolution, or MAVEN, mission. 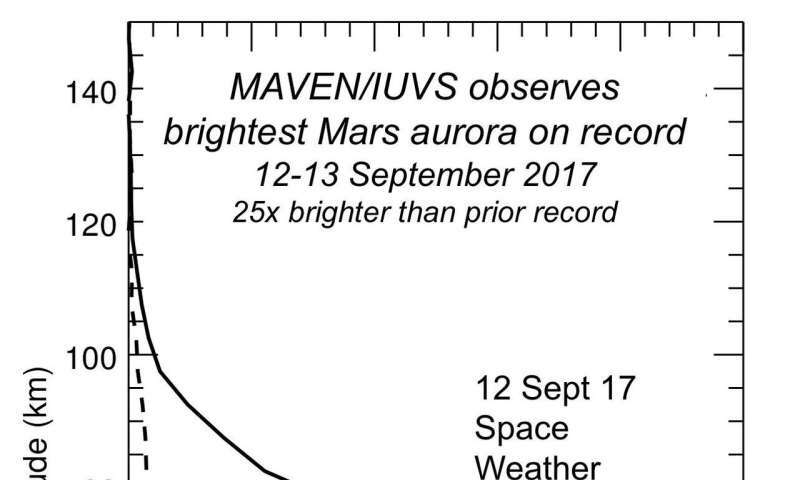 The solar event on Sept. 11, 2017 sparked a global aurora at Mars more than 25 times brighter than any previously seen by the MAVEN orbiter, which has been studying the Martian atmosphere's interaction with the solar wind since 2014. It produced radiation levels on the surface more than double any previously measured by the Curiosity rover's Radiation Assessment Detector, or RAD, since that mission's landing in 2012. The high readings lasted more than two days. Strangely, it occurred in conjunction with a spate of solar activity during what is usually a quiet period in the Sun's 11-year sunspot and storm-activity cycle. This event was big enough to be detected at Earth too, even though Earth was on the opposite side of the Sun from Mars. "The current solar cycle has been an odd one, with less activity than usual during the peak, and now we have this large event as we're approaching solar minimum," said Sonal Jain of the University of Colorado Boulder's Laboratory for Atmospheric and Space Physics, who is a member of MAVEN's Imaging Ultraviolet Spectrograph instrument team. "This is exactly the type of event both missions were designed to study, and it's the biggest we've seen on the surface so far," said RAD Principal Investigator Don Hassler of the Southwest Research Institute's Boulder, Colorado, office. "It will improve our understanding of how such solar events affect the Martian environment, from the top of the atmosphere all the way down to the surface." RAD monitored radiation levels inside the encapsulated spacecraft that carried Curiosity from Earth to Mars in 2011 and 2012 and has been steadily monitoring the radiation environment at Mars' surface for more than five years. RAD findings strengthen understanding of radiation's impact on Mars habitability, a key objective of the Curiosity mission. NASA is also using RAD findings for planning the safety of human-crew missions to Mars. Highly energetic solar events can significantly increase the radiation that penetrates through the atmosphere to the Mars surface. The increased radiation also interacts with the atmosphere to produce additional, secondary particles, which need to be understood and shielded against to ensure the safety of future human explorers. "If you were outdoors on a Mars walk and learned that an event like this was imminent, you would definitely want to take shelter, just as you would if you were on a space walk outside the International Space Station," Hassler said. "To protect our astronauts on Mars in the future, we need to continue to provide this type of space weather monitoring there." The Sun is always emitting a continuous stream of charged particles, mainly electrons and protons. Occasionally, eruptions called coronal mass ejections occur, with higher density, energy and speed of the ejected particles. These events vary in strength. Strong ones cause dramatic aurora displays on Earth, and very strong ones can disrupt communications. 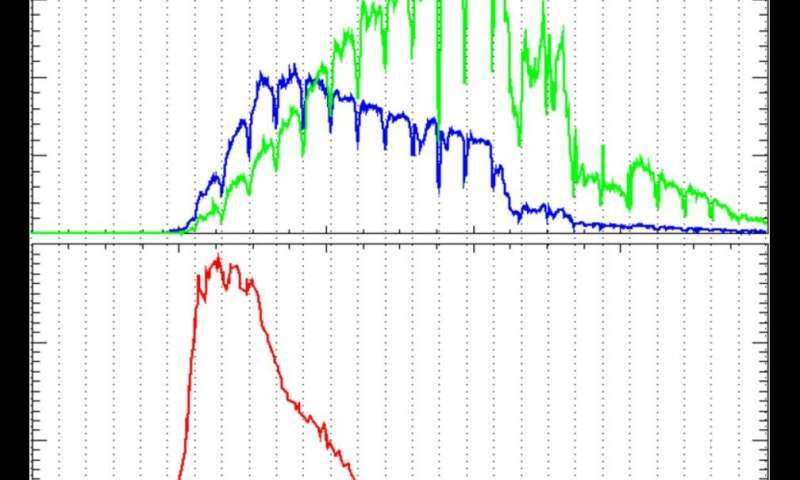 Some coronal mass ejections, such as this month's event, are broad enough in extent to affect planets in quite different directions from the Sun. Jain said, "When a solar storm hits the Martian atmosphere, it can trigger auroras that light up the whole planet in ultraviolet light. The recent one lit up Mars like a light bulb. An aurora on Mars can envelope the entire planet because Mars has no strong magnetic field like Earth's to concentrate the aurora near polar regions. The energetic particles from the Sun also can be absorbed by the upper atmosphere, increasing its temperature and causing it to swell up." Analysis of the data is just beginning. "We expect to get a better understanding of how the process operates in the upper atmosphere of Mars today, and a better understanding of how storms like this may have stripped away much of the Martian atmosphere in the past," said MAVEN Principal Investigator Bruce Jakosky of the University of Colorado Boulder. The loss of most of Mars' original atmosphere to space is linked to the planet's change from wet to dry, long ago. Besides the observations by instruments on MAVEN and Curiosity, effects of the Sept. 11, 2017 event were also detected by instruments on NASA's Mars Odyssey orbiter and Mars Reconnaissance Orbiter and by the European Space Agency's Mars Express orbiter. 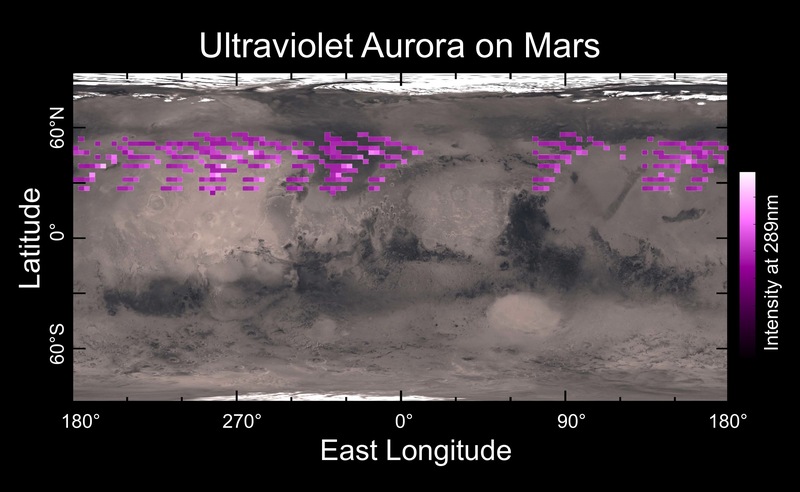 Does anyone know if either of the rovers got an aurora pic for a person's eye view of what auroras on Mars look like? The auroras are ultraviolet, mostly. You can't see them.